Structural dynamics is a subset of structural analysis which covers the behavior of structures subjected to dynamic loading. The subject has seen rapid growth and also change in how the basic concepts can be interpreted. For instance, the classical notions of discretizing the operator of a dynamic structural model have given way to a set-theoretic, function-space based framework, which is more conducive to implementation with a computer. This modern perspective, as adopted in this book, is also helpful in putting together the various tools and ideas in a more integrated style. Elements of Structural Dynamics: A New Perspective is devoted to covering the basic concepts in linear structural dynamics, whilst emphasizing their mathematical moorings and the associated computational aspects that make their implementation in software possible. Employs a novel ‘top down’ approach to structural dynamics. Contains an insightful treatment of the computational aspects, including the finite element method, that translate into numerical solutions of the dynamic equations of motion. Consistently touches upon the modern mathematical basis for the theories and approximations involved. 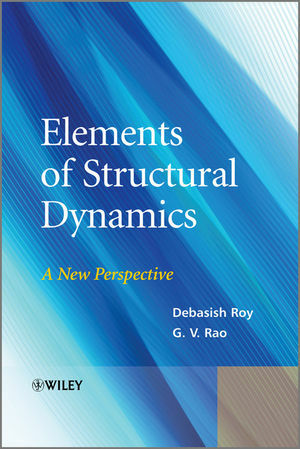 Elements of Structural Dynamics: A New Perspective is a holistic treatise on structural dynamics and is an ideal textbook for senior undergraduate and graduate students in Mechanical, Aerospace and Civil engineering departments. This book also forms a useful reference for researchers and engineers in industry. Debasish Roy is a professor in the Department of Civil Engineering at the Indian Institute of Science. He is a member of the editorial board for seven journals and has published circa 80 journal articles. His current research interests include Nonlinear and Stochastic Structural Dynamics, Linearization Techniques in Non-linear Dynamics, and Mesh-free and Finite Element Methods. Dr. Rao obtained his Ph. D in civil engineering from the Indian Institute of Science and has since been employed in industry. He has many years experience in experimental testing and research in structural engineering and also in research and software development in the area of structural dynamics using FEM. He is currently employed as an engineering consultant at Vasthu Shilpa Associates in India.